A bunion is a bony prominent that forms on the joint of big toe. It forms when there is too much pressure at the joint or at front of the foot. The main causes of bunion formation besides heredity reasons are having flat arches or arches that are too high, wearing tight shoes or shoes with small and narrow toe box, or wearing high heels too frequently. As the pressure increases against the base of the big toe, the joint of the first toe starts to increase the surface area to alleviate the built up pressure and that is how the joint of the big toe increases in size and slowly pushes the toe sideways toward the second toe. Bunions can be asymptomatic at the beginning but if they get ignored and left untreated they will become symptomatic and painful with deformity of the big toe. The best way of treating bunions are by finding out the cause of them. Most commonly, they are caused by the bio mechanical failure of the foot, flat or high arches. Custom foot orthotics are the most common and the most effective ways of treating the bunions. By providing a proper custom orthotics, they can support the arches and take the pressure off of the heel and the forefoot portion of the foot. Custom orthotics can reduce the pain and soreness from the area and eventually remove the pain slowly. However, one must note that, the formation of bunions is irreversible. 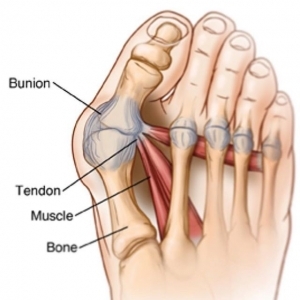 Bunions can be managed by proper footwear and high quality custom foot orthotics. Here at Burrard Chiropractic and Custom Foot Orthotics, we are specialized in providing high quality custom foot orthotics. Come in and visit us today, booking your next treatment is quick and easy.